I can’t believe that Halloween is just a couple of weeks out! This time last year we’d just had our baby shower and we were working hard to finish up and shoot Baby E’s nursery. At roughly 35 weeks pregnant, I was officially in the home stretch. I had already planned, prepped and photographed countless holiday season posts and I was racing the clock to do do do as much as possible before a little baby appeared in our lives. Being back in this season, with Halloween candy already stock piling in the pantry for the hundreds of trick or treaters we’re expecting, is kind of mind boggling. 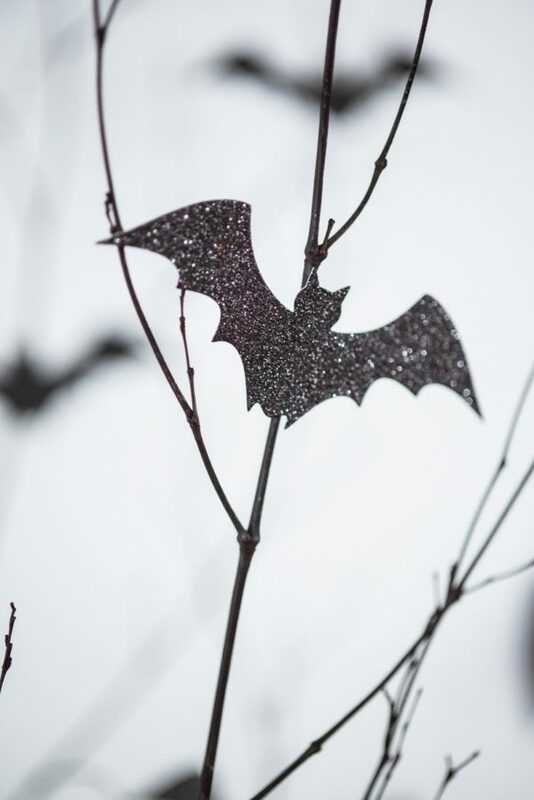 That said, I love good, simple Halloween decorations and DIY ideas so I have a few new ones up my sleeve to share with you this year. 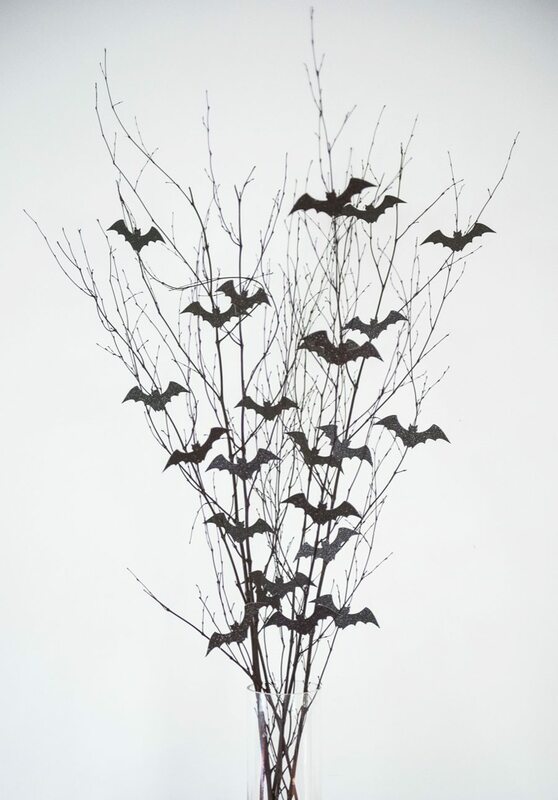 Today we’re kicking things off with a cool Halloween centerpiece that most closely resembles a plume of bats flying out of a bunch of branches. 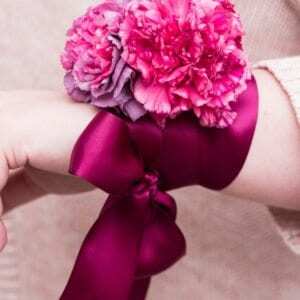 It’s a quick, easy craft that anyone can make in 20 minutes or less. Yes, anyone. Even those of you who think you aren’t crafty. 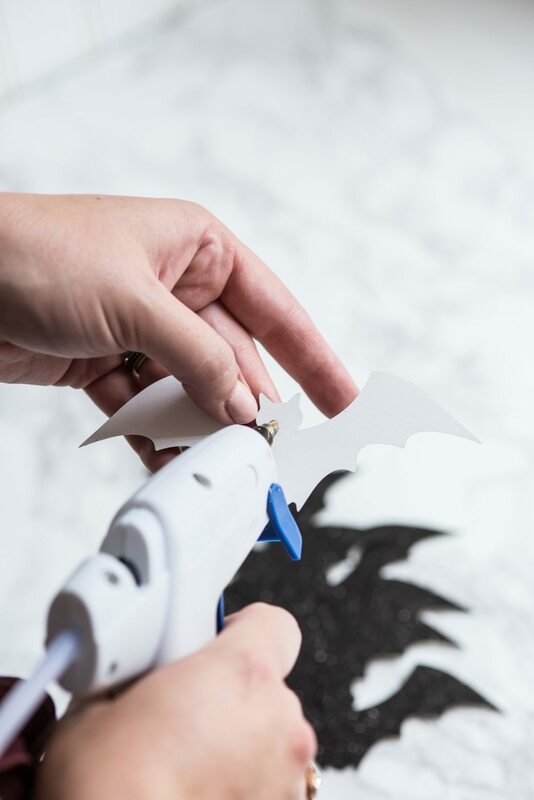 To get started you’ll need small bat shaped cut-outs of some kind. 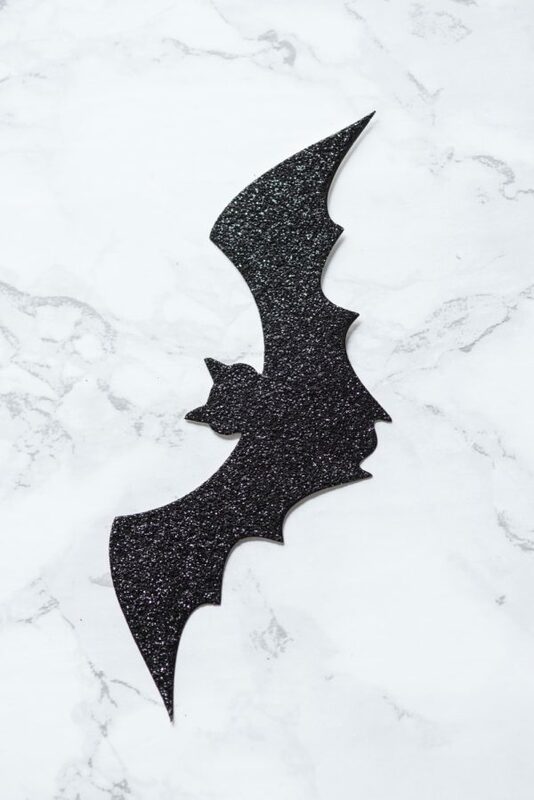 I found these glittery bats at Michaels and saw similar ones at Jo-Ann. Alternately, you could do a search online for a bat template or bat clip art to trace and cut out of black card stock. You’ll also need a bundle of thin, scraggly branches. I found birch branches at the craft store that happened to be painted black and were perfect for the centerpiece I had in mine. 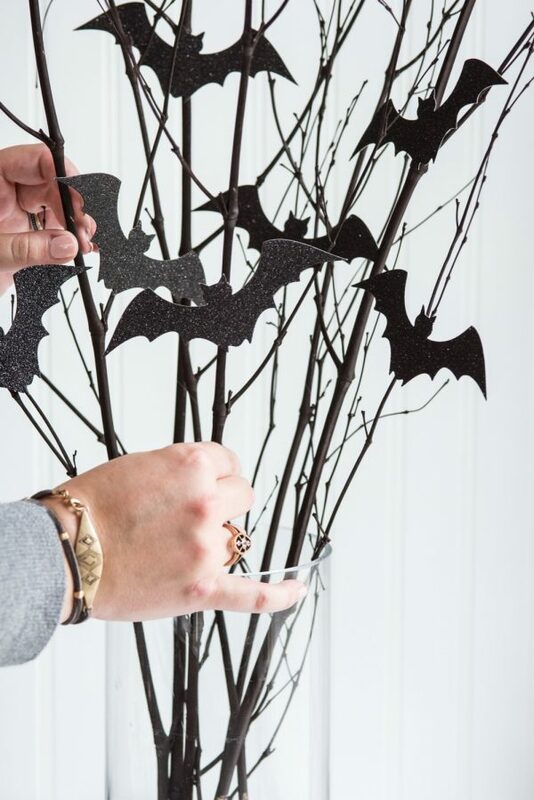 Try to find something at least 3′ tall to create a large, dramatic centerpiece to instantly add a little Halloween ambiance to your party. Arrange your branches in a tall glass cylinder vase until you find the arrangement you like best. 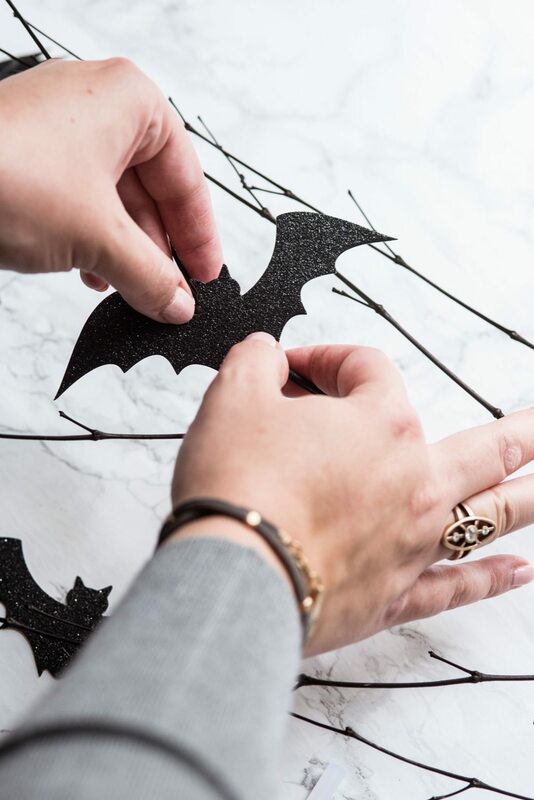 Then run a thin bead of hot glue along the backside of the center of the bats and carefully press each one onto a branch to secure. Be careful not to burn yourself with the hot glue! As you’re working, disperse your bats and make sure they’re pointed in slightly different directions to give them the appearance of a flock of bats that have been disturbed and are flying up and out of the branches in a hurry. 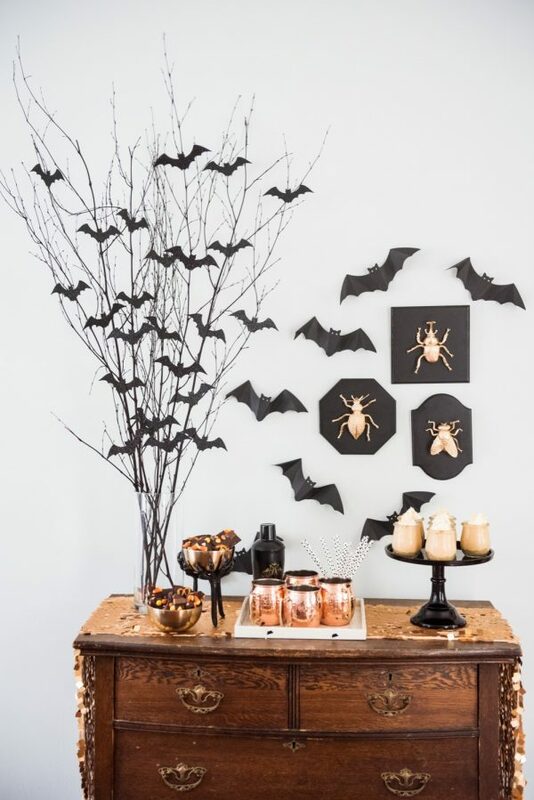 For reference, my centerpiece used 24 bats that were just shy of 3″ across the widest part of the wings. And that’s that, friends! 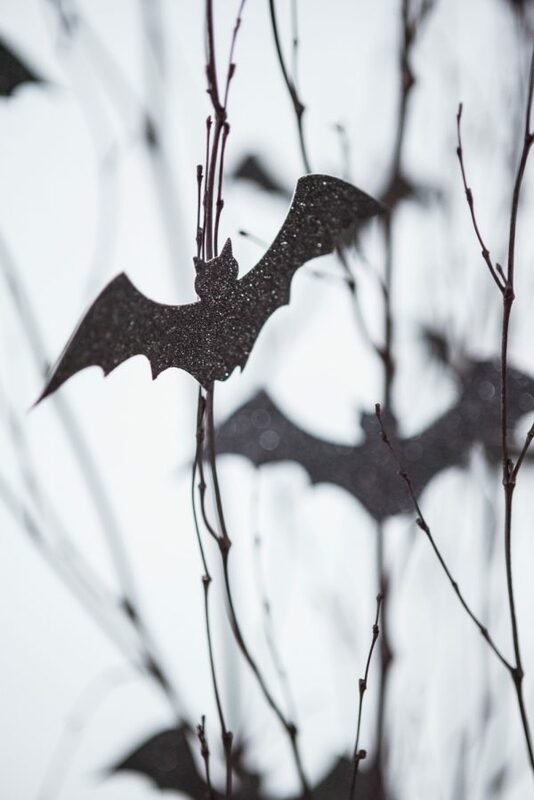 A fun, slightly spooky, simple Halloween decor idea for your repertoire. 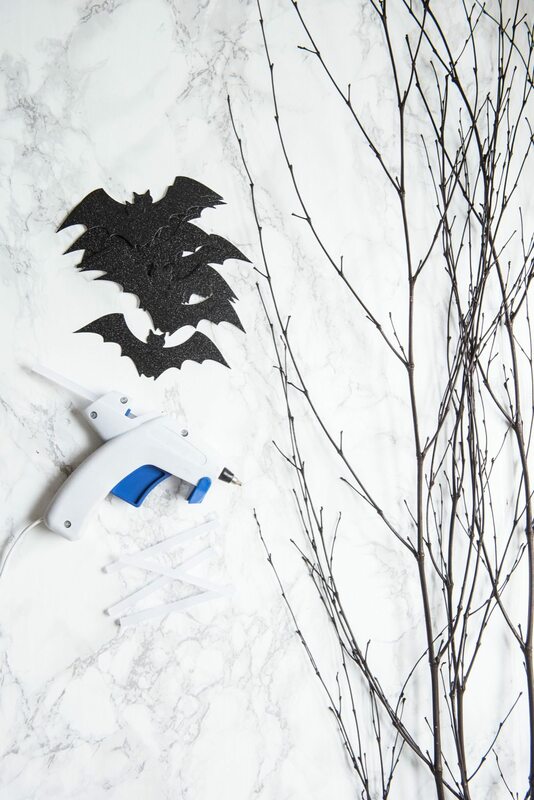 If you’re still feeling crafty, take a few minutes to check out more of my favorite easy Halloween ideas.